A diet of cod and chips — that’s the ticket! 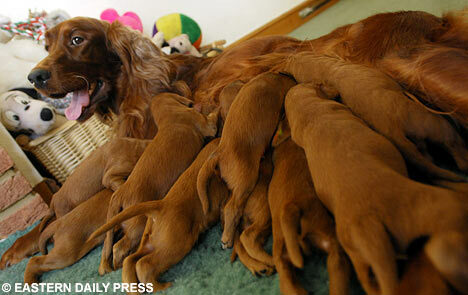 An Irish setter has had a record-breaking 16 pups – after wolfing down battered cod from the local chippy. Kelly’s bumper litter of puppies is proof that fish is just the job for a dog’s dinner. Her owner Dee Farndell [UK] last night revealed battered cod was the secret behind the stunning baby boom – the biggest in her 35 years of breeding. February 3, 2008 Posted by oldstersview | animals	| Comments Off on A diet of cod and chips — that’s the ticket!